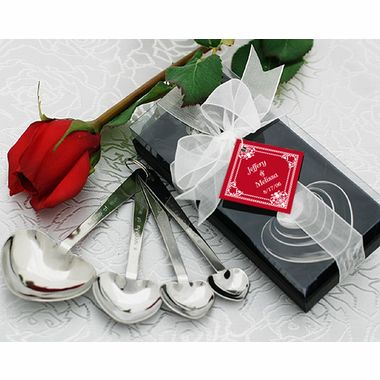 Set of 4 stainless steel measuring spoons with both traditional measurements and measurements of love. 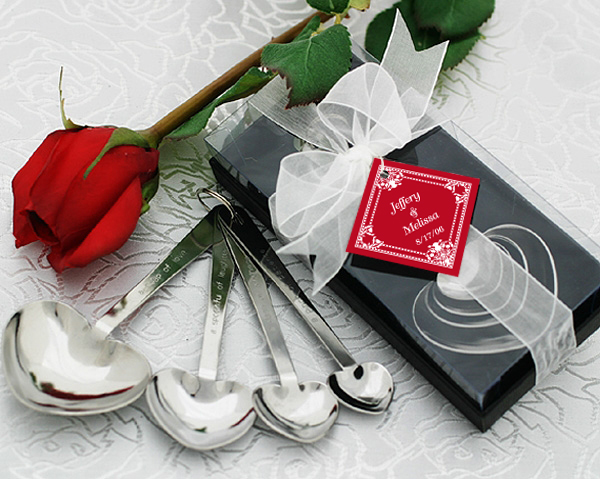 Each set of 4 spoons feature "measures of love" on one side with traditional measurements on the other. "A Pinch of Patience" = ¼ teaspoon, "A Dash of Kindness" = ½ teaspoon , "A Spoonful of Laughter" = 1 teaspoon, and "A Heap of Love" = 1 tablespoon. The set of measuring spoons is presented in a black bottom box with velvet lining and a clear top that measures 6" x 1 3/8” x 2 3/4". Each gift box includes a sheer white organza bow and a tag with silver heart that reads “Love Beyond Measure”.